RESCUE® Pastilles are alcohol and sugar free. 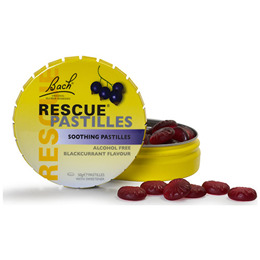 Each soothing blackcurrant flavoured pastille contains four drops of RESCUE® flower essences. The handy click shut tin makes it the perfect travel companion to grab and go. Bulking agents (sorbitol, maltitol, isomalt), gelling agent (gum arabic), Natural flavouring (blackcurrant), acid (citric acid), red cabbage extract, elderberry concentrate, black carrot extract, sweetener (xylitol), glazing agent (palm kernel oil, beeswax), flower essences (Helianthemum nummularium, Clematis vitalba, Impatiens glandulifera, Prunus cerasifera, Ornithogalum umbellatum [RESCUE®]). Below are reviews of Bach RESCUE Pastilles - Blackcurrant - 50g by bodykind customers. If you have tried this product we'd love to hear what you think so please leave a review. Great Customer Service. ordered a large quantity of this product and it all arrived within 3 days.